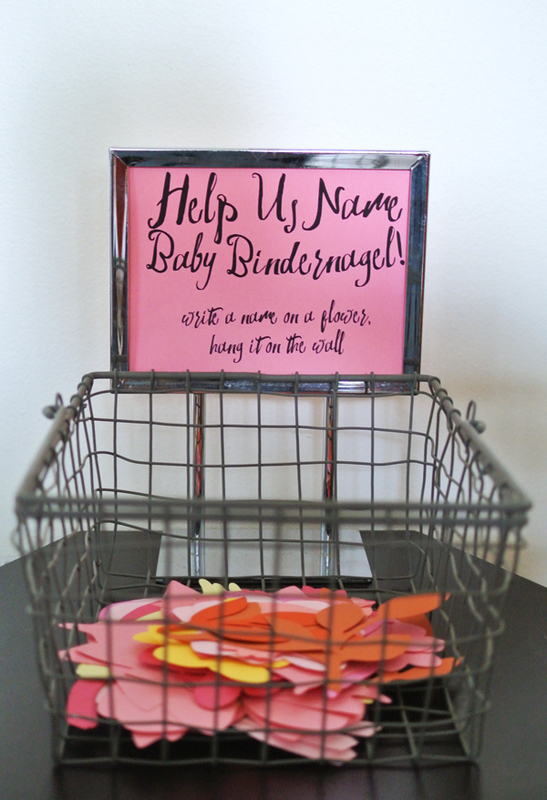 When one of my best friends told me that she wanted to throw me a baby shower, well, first I got all teary … and then I said I wanted to be in charge of decorations! We decided to throw the shower at our new house. At the time we totally thought we’d be all moved in by now for sure (haha), but we also thought it would be a perfect opportunity to have friends over to see the house before the holidays make all of our lives too crazy for a housewarming party. Early October worked out the best for everyone, even though I’m not due for three more months (can you believe that all our weekends in November and December are already almost completely booked???). The first thing I did when I started planning was to pick out the invitations. I wanted a jumping off point for the entire look, from the colors to the theme to the decorations I was going to make, so the invitation seemed like the best place to start. 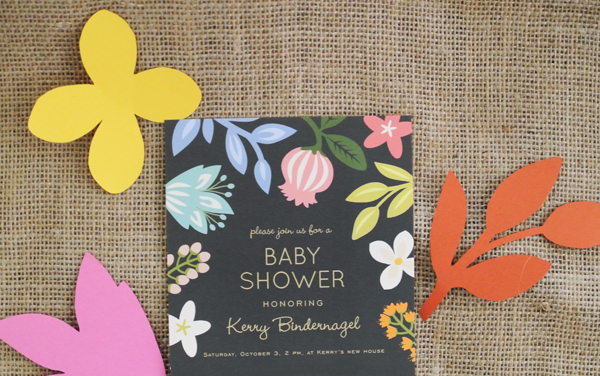 I fell in love with the colors on this invitation from Minted.com. 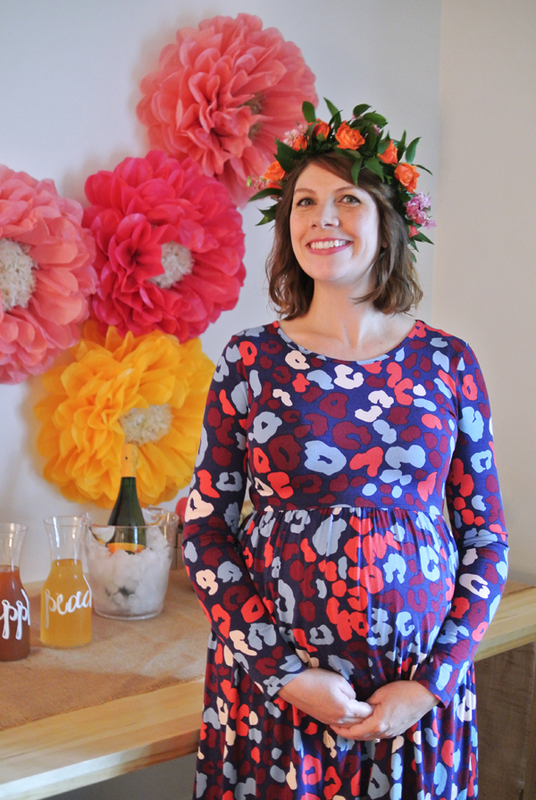 The black is a little edgy for a baby shower and the flowers are kind of mod, not super “baby,” and I thought it was perfect for fall. I decided to borrow from the flowers on the card and go for a “fall florals” theme in shades of coral, pink, orange, and gold. 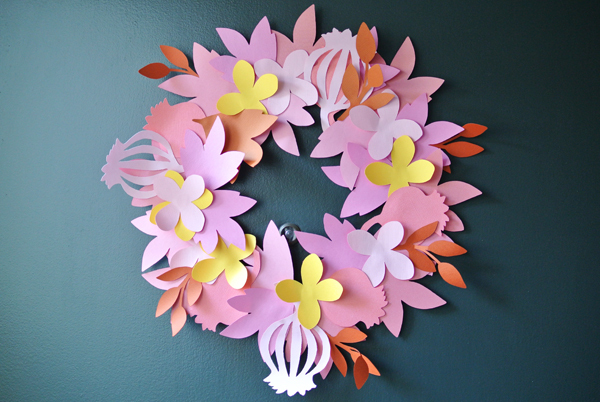 From the moment everyone walked up to the door, I wanted them to get an idea of what to expect, so the first project I did was make a wreath inspired by the flowers on the invitations. I’ll get more into the actual DIY in another post, but I just absolutely love how this turned out. It was a great greeting for everyone and really set the tone for the whole party from the get go. 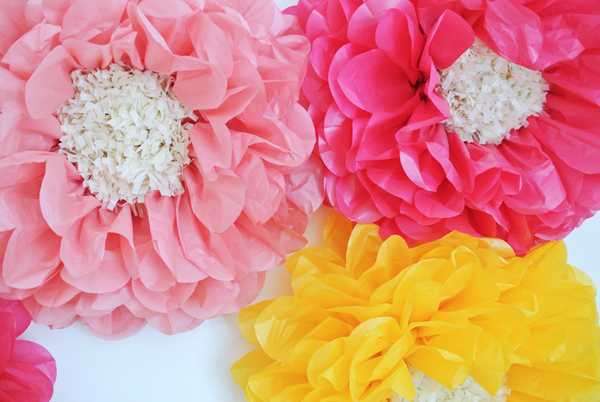 As a backdrop for the drinks and dessert table, I found this Martha Stewart Crafts tissue paper flowers kit . 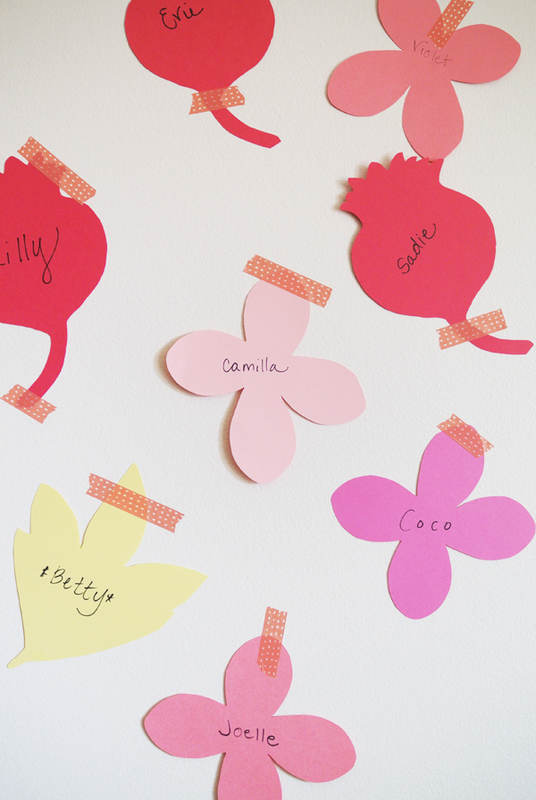 The five giant flowers in the kit just happened to be in our color scheme and they looked awesome on the wall. We hung them on Command hooks. We’re totally keeping these up on the wall in the living room for now, but you might just expect to see these show up in the baby’s room someday! 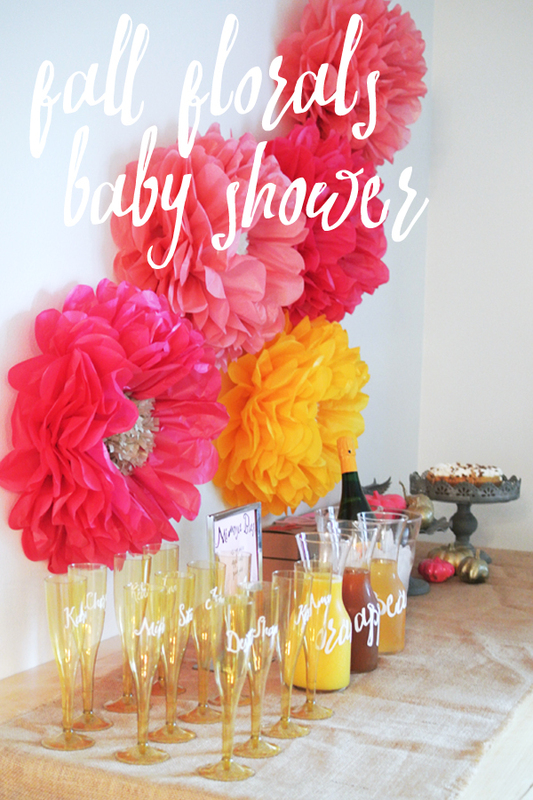 We set up a mimosa bar with a few kinds of juice, bottles of bubbly that all the guests brought, and Sprite for the pregnant ladies. Seriously, you can barely tell the difference if you just put Sprite in your oj instead of real bubbles. Or maybe I just can’t remember what real bubbly tastes like, but either way, believe me that it’s good. Also, if you haven’t had an apple cider mimosa (real or faux), you need to fix that. 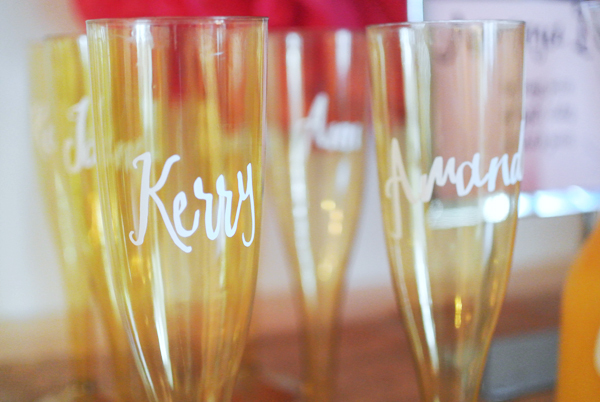 To personalize things and allow the guests to get to know each other’s names, I used my Cricut Explore to cut all the guest’s names on sticky, white Cricut vinyl that I attached to disposable gold champagne flutes. I loved this detail and it was surprisingly easy. 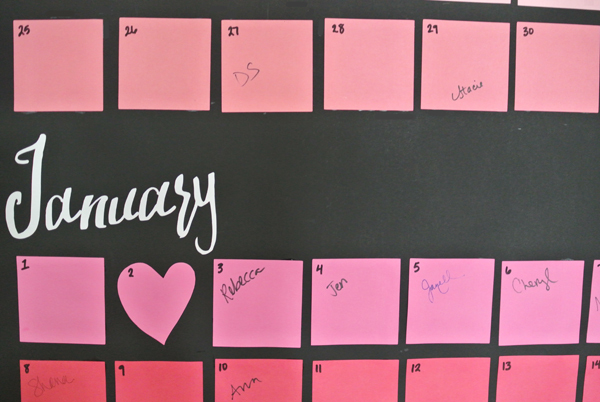 If you don’t have a Cricut/cutting machine, you could do the same thing with a Sharpie and some good handwriting. 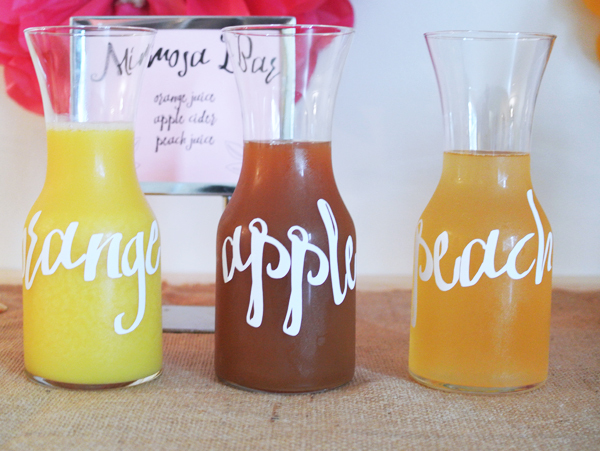 I also added vinyl labels on the juice pitchers and printed out a Mimosa Bar sign using the same font, Swirlesque. I think choosing one font for all the details makes a huge difference in unifying all the separate elements, and I spent a ridiculous amount of time choosing just the perfect one, ha! 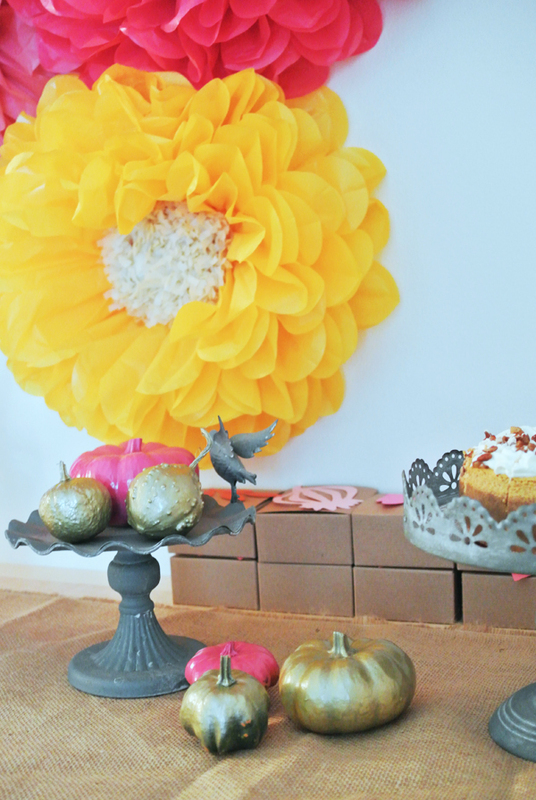 Because it’s October and because I love pumpkins, we spray painted a few mini pumpkins and gourds in gold and pink to use as decorations on the table. For the favors, which you can see stacked up in the background, I put donuts in 4×4 kraft paper boxes and decorated the top of each box with different paper flowers that matched our invitations. I really, really don’t like games. 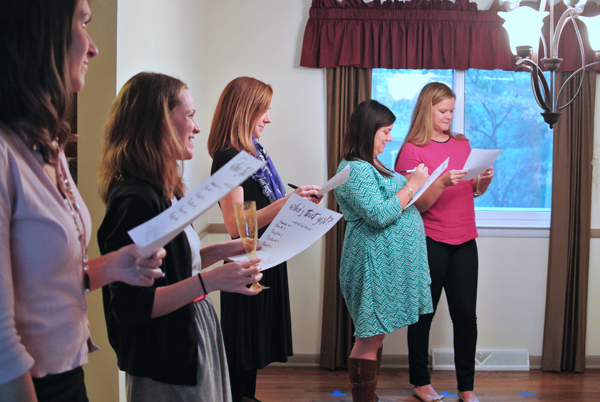 Games of any kind stress me out and are so not fun for me, but baby shower games are usually the wooooorst. Ugh. So we decided to do a few non-game games to get everyone interacting, but not actually make anyone do anything annoying: guess the birth date, guess the baby photo, and name the baby. We asked guests to bring a baby photo of themselves so we could “match the baby to the lady.” A lot of guests forgot their photo, but it was still fun. I don’t think a single person guessed me right! 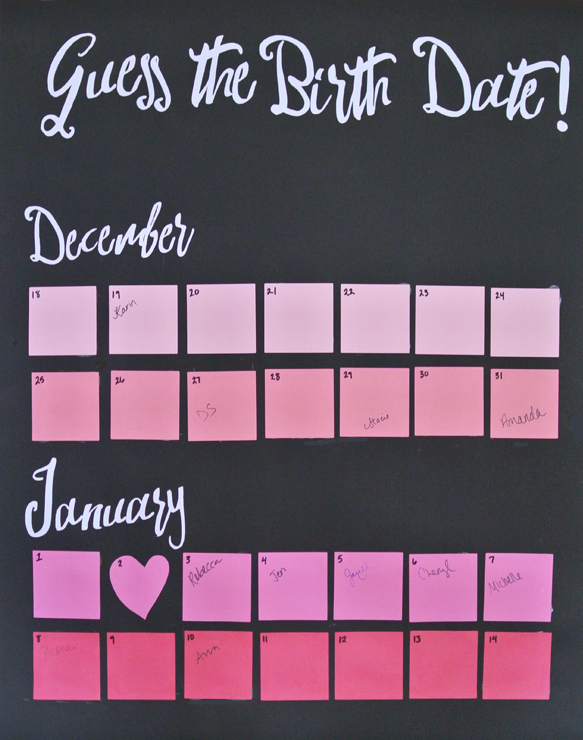 I also made a calendar to have everyone guess the birth date. This one won’t have a winner until I actually give birth, but it’s still fun. I just hope that no one picking Christmas or New Year’s is foreshadowing! I had THE BEST time at my shower. I was nervous about opening presents in front of people, but it wasn’t as embarrassing as I expected, especially because the gifts were full of the most adorable (and much-needed) things ever!! It was mostly just so fantastic to see all my friends and it meant the absolute world to me that they threw me this party and went to so much trouble to make food and come out on a icky ucky cold and rainy day. Andy’s family is throwing me a shower as well in a few weeks, so I’m really excited about that one, too. Also, I got a flower crown!!! It was a surprise from my friend who threw the party, made by Urban Orchid, and my dress is from Asos. You have some really cute ideas. 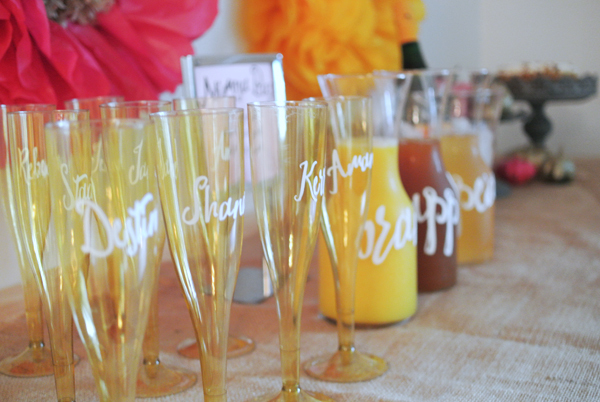 I especially am interested in the disposable mimosa flutes. Where did you find them & were they expensive? Thanks so much, Carol! The disposable champagne flutes were from Party City and they were definitely not expensive from what I remember.